Then I assume iTunes 9 is still running 32 bit. 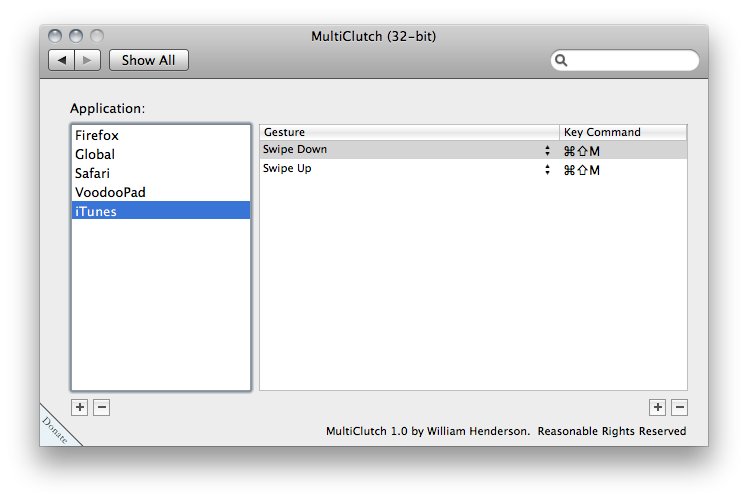 Multiclutch is working fine with it under Snow Leopard on my machine. Multiclutch is also working for the new iChat, where I have it setup to swipe between tabs. Of course, your Palm Pre sync issue trumps other issues for upgrading I’m sure. No go on my 13″ MacBook Unibody running Snow Leopard. Sort of sad about it. Any idea how to setup a three finger swipe up to bring mini player to the front? 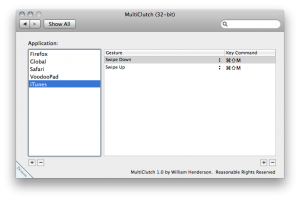 Dang Aaron, I guess Multiclutch will be hit-or-miss until it’s (hopefully eventually) updated for 10.6. I’m not having any problems using it, but I already had it installed before I updated my system to 10.6. I don’t know a real easy way to make a swipe bring the mini player to the front, but clicking on the iTunes icon in the dock will accomplish that without any trouble.